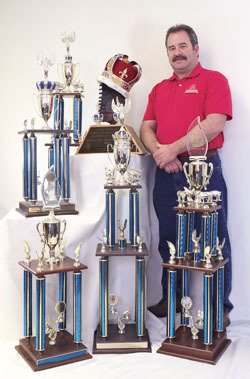 Chris Marks is a nationally recognized elite competition barbeque chef and barbeque business leader from Kansas City. Chris has won more than 50 national barbeque championships, and over 600 individual awards including the Jack Daniel’s World Championship BBQ Sauce Championship, and the Grand Daddy of the all the American Royal in Kansas City Grand Championship 8 times. He has been featured on the Food Channels “Taste of America” with Mark De-Carlo, Travel Channels “BBQ Battle”, and numerous other local and regional BBQ shows. Chris is the CBBQE (Chief BBQ Expert) of The Good-One Manufacturing, LLC working with BBQ Specialty dealers across the United States developing their stores into premier BBQ specialty destinations hot spots. He continues his passion of BBQ by endorsing the Good-One ™ Smoker/Grill, promoting, mentoring and providing BBQ classes. You can contact Chris at threelittlepigsbbq@gmail.com for any questions regarding the Three Little Pig’s BBQ Rub & Sauce Line or BBQ Class’s.